There is an aspect of his game he needs to improve, when he is close to the box he doesn't act as a full back. His priority seems to be to find a gap to shoot instead of picking a player to pass the ball. Defensively he looks pretty inept whenever he gets a chance in a back four. He is young, so hopefully he'll improve but nowhere ready to be our first choice right back next season. Anyone still saying why should we buy AWB when we have Dalot can put that to rest. Dalot is a good winger for now but a shocking full back defensively. I don't think I've seen him have an accomplished RB performance yet. Which means good defensively as well as offensively. As everyone said, he's pretty young and he's good for his age. But it just highlights that we can't go into the new season with him as our starting RB. He's not good enough yet. Not sure what he did today that proves he was any better offensively either? His crossing was diabolical today. It's better than Young but that shouldn't be the standard. Very disappointing performance. Beaten so many times by Masuaku. We do need a ready made RB next season. 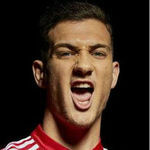 Dalot should be given time to mature and be better gradually. Absolutely. None of these guys are proven enough to be trusted upon. Only DeGea, Lindelof, Shaw and Pogba would be guaranteed as starters. Every position needs competition and upgrades. They either need to be coming from better players from the Academy or more established signings. He was supposed to be accomplishing what a wingback is supposed to accomplish. Obviously. Now those stats do prove he was less involved than Ashley Young in the same position(ish) but the positive involvements I mentioned (that you’re determined to ignore) show why Ole wanted to give him a crack in that position. I’m ok with watching young players learn on the job, without throwing my toys out the pram if/when they don’t perform as well as a more experienced player might have in their place. Same reason I didn’t follow your lead in consistently shitting on last night’s goalscorer since his very first appearance for the first team. You’re someone who has always had a keen interest in the reserves/academy. Now it looks like few years without our usual stellar success means you can no longer be bothered with showing a bit of patience for younger players that are still learning the game. And the tactics jibe indicates you’re losing patience with new managers even more quickly. The post Fergie era has been bringing out the worst in loads of United fans so you’re not alone there. A pity but there you go. He didn't accomplish what a wingback does though. A wingback gets up and down the line which he didn't. He stood on the touchline doing nothing which isn't the role of a wingback. A wingback gets up the field and provides the wide threat on their side, something we know Dalot is capable of but seemingly refused to do against Wolves so clearly he wasn't accomplishing what a wingback does. The positive involvement you mention was one take on and one cross. Which you seem determined to use to excuse 83 minutes of doing absolutely nothing. That position, that is the problem he didn't play a real position and did nothing. If Ole wanted him to play as a wingback and bomb down the field and show his attacking attribute which we've seen are good then of course that makes perfect sense. Except he didn't do that. He barely got involved and did the exact opposite of what he'd been doing in his previous impressive cameos. When he plays the complete opposite of how he's previously looked good at then it should be questioned. I'm perfectly fine with young players learning on the job. That doesn't make them immune from criticism and it certainly doesn't mean they should be our starting RB like so many people like to claim. When people claim he should be starting every game then he'll be judged accordingly, and when he goes up against Wolves and hides for 80+ minutes he'll rightly get criticised when people are claiming that deserves to be our starting RB. I have loads of patience for our younger players and I am perfectly fine with them learning as they go. When people start claiming they should be starting every game then no I will not agree and I'll call out why they definitely shouldn't be starters. I've said before Dalot should be playing every cup game and against bottom table teams and even used as a RW sub to get extra game time because he needs to get as much time as possible. But no he shouldn't be our starting RB and no having him doesn't mean we can go into next season without a new RB. Just like I'll have patience for Greenwood but when people claim he should be starting over Lukaku then that is quite clearly ridiculous. Just as are claims for Chong etc to be starters for us. I'd love for loads of our academy lads to get more playing time. I don't go around claiming they should be starters though. And nor is Ole immune to criticism and questioning. The tactics against Wolves were dreadful, how can you possibly deny that? When he decides to play with a false RB, no width and one forward who is completely isolated then he should be questioned. Just because he is Ole we don't just sit here happy as Larry when he plays two players in one position and they do feck all the entire game. Did I claim he should be sacked for it? No, of course I didn't. Poor today, I actually thought he looked better when he moved to LB. Yeah, it's become clear why Ole has been bleeding him as a winger and playing Young as RB, because he simply isn't defensively reliable enough yet. I am now in the AWB camp, or Meunier, or both even, we can't rely on Dalot coming good next season. Don't understand his fandom on here. He is a mid table player if I have ever seen one. Have the guys asking us to sign him seen him play? Or the clamor to get him simply because he once said that he is a United fan? He is not the answer. We need a top class signing. The addition of AWB should help bring the best out of dalot. We can let him then take his time to develop defensive attributes and use him as an attacking option, whenever necessary. AWB is not good enough going forward if we want to become top team who competes for top honours we need to bring more players who are comfortable on the ball and are effective in offensive phases of the play ,we need to become team which plays on the front foot and let opposition worry about us, we already have good defensive fullback in Shaw it would be overkill if we add another one inWan Bissaka who excels defensively but isn't of much use going forward. He looked lost defensively, I think he played about 3-4 games at the back but none looked convincing yet. All his best games were in the attacking positions. The kid isn’t ready yet for next season, we desperately need a first team RB and he will be a good understudy for both the full back positions / RW. From a neutral's perspective, he looked really good. Has a different mentality when going forward, compared to most other United players on the pitch. He’s a long way off being able to start regularly. If we don’t buy a RB in the summer we’ll be seeing a lot of Ashley Young next season. He was decent yesterday, one or two cracking deliveries which as usual noone attacked. If a RB is excellent defensively, it doesn't matter if they aren't great going forward. Defending is the priority for defenders. If a CB is good on the ball, nice bonus, if FB is good going forward, nice bonus. Wan Bissaka has made 144 tackles, whilst being dribbled only 12 times and committing only 23 fouls. That's the best 1v1 defensive stats I've ever seen. Well it's one of the main reasons people always have a go at Shaw. I rally like this guy, and I feel he can turn into a brilliant FB for us. His attitude to going forward isn't the problem, it's the defensive aspect. We also had Shaw and Lindelof out yesterday so our defence was poor, putting more pressure on Dalot. If we don't get a top class CB this summer, we need to buy a RB. Preferably we get both. AWB is the best available but if we are relying on our FBs going forward because we don't have wingers, maybe Meunier is the right option. He was ok. He strikes me as one of those players that will get knocked down and get straight back up and go again, which is rare in today's game. Still work to do on his overall game but I would be happy to see him finish the season at RB and gain experience. I've yet to see him have any game worse than this season's average Ashley Young performance. Next season maybe he is not ready, but if it's between him and Young, I'd play him every time. Looking more and more like a very good utility squad player to have. Talented footballer but he can't defend. I'm a huge fan of Dalot. He's raw and very inexperienced but I love his attitude. He's aggressive in everything he does and has genuine quality when he gets forward. Is he ready to be first choice next season? Probably not, but with Young on his last legs and Shaw the only other decent full back at the club, he will get plenty of games at full back in the coming years whether United signs a full back or not. Like him. Think he will come good and in a side that was more dominant in possession I'd venture to guess he'd look more developed than in this current United side. That said, he's not good enough defensively right now and not so good we shouldn't look for another RB option. AWB would be a good choice IMO. If we're looking for a more experienced option maybe Meunier would be available from PSG. Also would see if Real are interested at all in moving out Carvajal. Bit surprised by the feedback from yesterday. Thought he was decent. What a change it makes when your right back can cross a ball that goes past the first line of defense and actually looks dangerous. To be honest, I liked Dalot's attacking in the third final, especially when he gets through defenders with his run to look for cross or low cross. Defensively, it's not really bad but still average, hope he can improve on this with experience. Young wasn't great defensively either. I said this in December. I'm keen on us keeping on playing Dalot through this season. For me, playing Young and Valencia does nothing for us because we know what they're all about and it's not good enough (going into next season). Dalot might be, and giving him the next 6 months might pay off. So here we are in April, we've continued to play Young through at RB. Now that we're safely out of the CL and out of the top 4 spots, we can definitely confirm he's not good enough. So what would've been the harm in playing Dalot? I strongly felt that by Christmas he would have established himself as first choice right-back. I don’t know if injuries hampered that as he did miss a lot of games. Valencia has clearly been phased out but Perhaps Mourinho and Ole have felt they could squeeze this season out of Young and his experience would be beneficial. Clearly Young has quite badly lost it. Dalot at right-back from now on, for me. He almost had an assist tonight in limited minutes. If we had of persisted with him he would have improved yet we’ve wasted countless minutes on one of the worst players ever for United. Ole needs to get rid of the sentimentality and be more cutthroat. Young should not be in the starting 11 again all season. We’d be several points worse off. Young’s form has gone to shite but he’s been solid enough for most of the season while Dalot has looked defensively inept from day one. Hence he’s only getting games as a winger. Hopefully he’ll settle in and we’ll see him sort out the defensive part of his game. Still looks raw as feck right now though. He can't be worse than what we saw tonight but if i'm honest, i'm not really seeing the hype with Dalot and he doesn't look ready to me. This is his first season and he's very young but I don't think he's shown much whenever I've seen him. The fact that Young is starting in either full back slot is telling me that our full back options are dismal and that our recruitment and club direction has been/is shocking. Dalot should be considered one for the future. I don't enough about coaching and psychology but is there any truth to the idea that playing a youngster who might make a lot of mistakes can set his development back? I think saf tried to avoid this. Also could apply to rashford who has regressed recently. Maybe too much pressure is detrimental. His attitude is always good and he showed that again tongight, coming on when we were dead and buried but he still looked to try and make something happen and created our best chance since the Rashford one in the first 30 seconds.